Platform Thinking: Innovation is too expensive to continue to just think about portfolios of individual new products and services... if it's not "platformable" it won't maximize your innovation investment. To instill an appreciation for, and understanding of how to leverage "Platform Thinking" for more effective and efficient investment in innovation. Gone are the days when companies could fund new product or service innovation by betting on one product or service family generating the growth and ROI that justifies the investment. 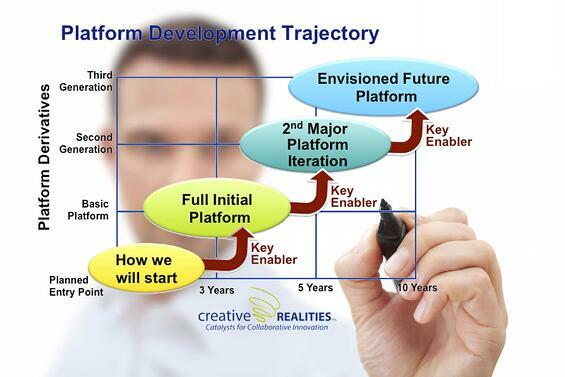 Platform Thinking is a mindset and a process for considering how the investment could be leveraged in multiple revenue streams and value generation. This 1-2 day training workshop for 12-16 participants is designed to create a solid understanding of the principles behing Platform Thinking. Using real-world examples, the workshop will cover the various approaches to Platforming, defining and engaging the team in understanding and applying the thinking to your business. Day 2 includes an in-depth workshop on platforming within your company and applies this thinking to new innovation that is in your early development process. With an innovation group that understands the concept of Platform Thinking, your innovation team recommendations for investment will be based on a broader, more long-term and more strategic view of growth and more efficient use of innovation resources. Platform thinking took equipment that had sat idle, gathering dust for 10 months a year, and turned it into a leverable investment creating year-round revenue and profit, and provided the means for this company to move from limited distribution into National distribution at major retailers.